A new era for treating AMD? Holly Coombs explains how doctors performed the first bionic eye implant in a patient with the most common cause of sight loss in the developed world. Implants, wireless transmitters, electrodes... It sounds like something from a science fiction movie, but incredibly, this is the reality for 70-year-old Ray Flynn from Manchester. 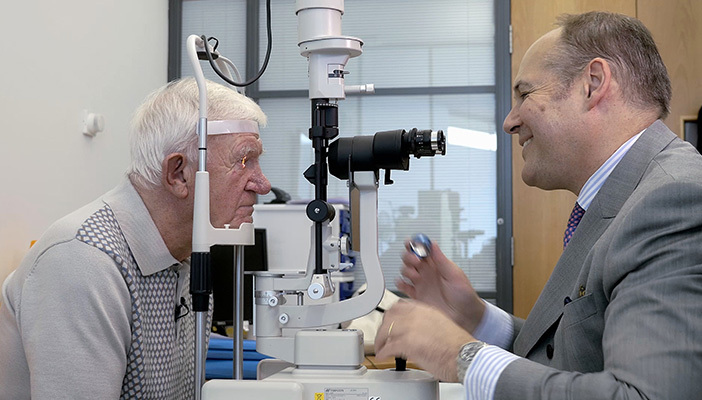 He has dry age-related macular degeneration (AMD) and has received treatment using cutting-edge technology as part of a trial at Manchester Royal Eye Hospital. Dry AMD is the more common type of AMD. It can develop very slowly and causes a gradual change in your central vision. Dry AMD usually takes a long time to progress, and can take number of years to get to its final stage. At its worst, dry AMD causes a blank patch in the centre of your vision in both of your eyes – but as it doesn't affect your peripheral vision, it never leads to total blindness. There is no treatment for dry AMD, so the trial could offer help in the future for people with this eye condition. Ray is the first person with this condition in the world to be fitted with what some are calling a ‘bionic eye,’ a retinal implant known as the Argus II. What was the condition of Ray’s eyes before the treatment? Ray has advanced dry AMD and has had no central vision for around eight years. Like many people with sight loss, he has to rely on support – in his case, his brother - to do lots of day-to-day activities, from cooking to reading bills and newspapers. What did the surgery consist of? The operation took four hours and. Professor Paulo Stanga, Professor of Ophthalmology and Retinal Regeneration at Manchester Royal Eye Hospital carried out the delicate procedure. How does this help improve vision? Patients fitted with the implant wear a pair of special glasses, fitted with a small video camera. The camera sends these images as electrical pulses, which are transmitted wirelessly to the implant on the eye. These pulses stimulate the remaining working cells in the retina, causing the brain to see patterns of light. While this is not the same as natural vision experienced before sight loss - patients should expect “somewhat pixelised” spots of light – this can prove invaluable in helping people to complete everyday tasks. With time and training, patients learn to interpret these patterns, regaining some meaningful vision such as seeing outlines of people and objects. What difference has this made for Ray? For the first time in many years, Ray has regained some functional central vision. During initial tests, Ray has been able to see horizontal and diagonal lines on a screen, and with time and practice his visual function is expected to improve so he can do more of the things he enjoys. How do doctors hope to take this treatment further? Second Sight, who manufacture the implant, have described this trial as “totally groundbreaking research” and they now plan to refine and improve the treatment, in time extending the trial and expanding to other clinical centres. Manchester Royal Eye Hospital is looking to extend this particular trial to include more patients with dry AMD. They are considering also opening it to patients with the wet form of AMD in the future. As this treatment is currently only available as part of the clinical trial for AMD patients, there is no cost attached to the procedure at present. However, the actual cost of the Argus II system, including treatment and rehab costs, is £150,000. While the Argus II is commercially available for patients with retinitis pigmentosa in some countries, it is not currently available on the NHS. When could other patients hope to have similar treatment? The treatment is still in its very early stages. The bionic eye is not an instant fix; patients require gradual rehabilitation. Much more research needs to be done to discover the full potential of the device, and into how much post-operative training is needed to fully utilise it. As with all treatments, results can also vary dramatically between individuals. Patients with advanced end stage dry AMD who are interested in being assessed for the trial in Manchester should contact Danielle Ridyard at Manchester Royal Eye Hospital on 0161 701 7691. Patients should bear in mind that the trial will include multiple visits to the hospital in Manchester throughout the trial, surgery and rehab process.